Gamivo at £3.57 seems the closest to this. Can be used on new or existing accounts. What games are currently on this EA ? The Anthem 10 hour trial is live now! Full list here. can you stack a couple of these, or is it like game pass? I have had 12months before that ran out few months ago can i still use a 1 month code? Is this for new accounts or will it work if you've previously had EA access? Yeah you can stack them, that's what I did last time. 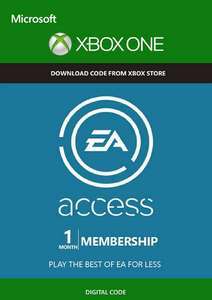 Is this for new accounts or will it work if you've previously had EA …Is this for new accounts or will it work if you've previously had EA access? For new and existing accounts. I have had 12months before that ran out few months ago can i still use a 1 …I have had 12months before that ran out few months ago can i still use a 1 month code? Ordered this but when I click the download link in the conformation email …Ordered this but when I click the download link in the conformation email there’s nothing there. Anyone know how to access please? you should get to the code if you click on the download link in the email. …you should get to the code if you click on the download link in the email. I'd contact support if you have tried a few times and it doesn't load up the code for you. They are usually pretty quick.